One of the toughest parts of being a coach is finding the right drills for your kids. This is a mix of a drill that is easy to learn, easy to practice, and can be carried back onto the court at game time. On top of that, these drills are fun - so the kids want to learn them and keep doing them. 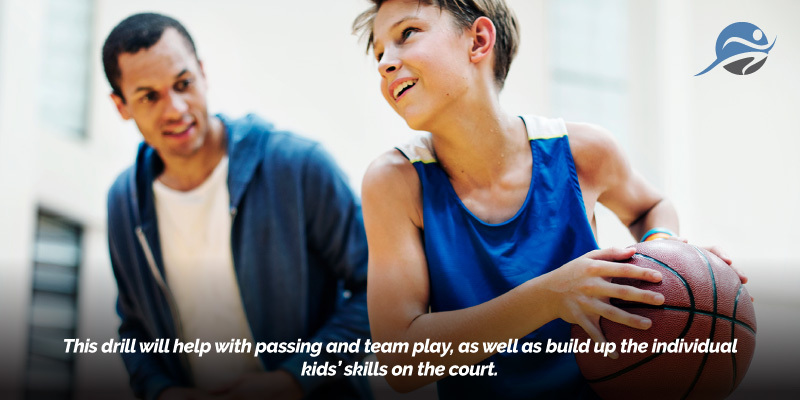 Fun drills are a great way to help kids fall in love with, and stay in love with, the sport. At Hustle that is our goal. More kids playing the game, more coaches with the tools they need to help these kids find their calling. If you haven’t yet downloaded our app, check it out today to find even more great tips and tricks that can help you in your coaching endeavors. We chose some drills and broke them into the following categories: General, Dribbling, Shooting, and Handling. The goal of the game is to make your shot before the person behind you makes their shot. The first shot must always be from the free throw line but after that can be from anywhere on the floor. To Play: All players line up in a straight line behind the free throw line. The first two players in line have a basketball.. the first person in line taking a shot. If they make it, they quickly rebound their ball and throw it to the next person in line. If they miss, they must rebound the ball and score as quick as possible. As soon as the first player has shot, the second player can begin. If the player behind scores before the player in front, the player in front is out. The drill continues until there is one person left and they are crowned the winner. There are just a couple of rules to this drill, if played the way described here. These are: “A) The person in front must always shoot the basketball first. And B) Players can’t intentionally miss the free throw shot off the backboard and lay the basketball in.” However, as a coach you should feel free to vary the game if you can see a way to improve it. The game begins with Player No. 1 deciding on a shot he wants to take, announcing it, then taking it. For example, he may say, "lay-up," or something zany, like, "Turn around in a circle twice, then shoot backwards through your legs." If Player No. 1 makes the shot he calls, Player No. 2 must make the exact same shot. If Player No. 2 fails, he receives the letter "H." If he makes it, Player No. 3 must now make the shot, and so on If all players make the shot, the ball goes back to Player No. 1, who must re-make the shot. Play continues until someone misses this particular shot. Once someone misses, he receives an "H" and the next player in line calls the next shot. So what happens if Player No. 1 calls a shot and doesn't make it? He gets an "H," and Player No. 2 calls a new shot. As the game continues, every time a player misses, the rest of the letters in the word "H-O-R-S-E" are added to his score. Once someone has received all five letters and spelled H-O-R-S-E, he's out. The last player left is the winner. Identify 2-3 participants as "It", these participants do not have a basketball. Every other participant is dribbling a basketball. The participants who are "It" attempt to steal a basketball from one of the participants who is dribbling. If they manage to steal a ball, then that person becomes "It" and attempts to steal a ball from another participant. If a participant loses control of their basketball and a participant who is "It" retrieves it, then the participant who lost the ball is now "It". Each player shoot free throws three at a time. Keep score by scoring one point for every swished (no rim contact) shot, no points are scored on a made free throw that hits the rim, and a minus one point for a missed shot. A perfect score is 3 points. The player with the most points at the end of the game wins. You can develop variations of this for the older and more advanced kids.